https://en.wikipedia.org/wiki/TranscendentalismOn the 200th anniversary of the birth of Henry David Thoreau, I'd like to share a little about his life and legacy. He came from a family of pencil-makers and was raised in a modest home in Concord, Massachusetts. When he was 20 years old when he met Ralph Waldo Emerson and was influenced by the budding Transcendentalist movement. At age 24 he moved into the Emerson home to tutor the children and at age 28 built a hut on Walden Pond where he lived quietly for two years, his reflections on which would became Walden the first great environmentalist text. How do we measure the cost of things? The cost of a thing is the amount of what I will call life which is required to be exchanged for it, immediately or in the long run. Two weeks after his 29th birthday, he ran into the local tax collector who asked him to pay six years of delinquent poll taxes. Thoreau refused, declaring his opposition to the government’s involvement with the Mexican American War and endorsement of slavery. He spent a night in jail. As he turned 30, he published his monumental essay entitled Resistance to Civil Government which is also known as Civil Disobedience. When the Fugitive Slave Act of 1850 was passed two years later, Thoreau actively helped former slaves flee to Canada. While his friends among the Transcendentalists recognized his literary genius, it would take decades, even a century for his work to be broadly embraced. The wider world would not come to appreciate his work during his lifetime, other than an extraordinarily controversial essay he wrote entitled, "A Plea for Captain John Brown." John Brown was an abolitionist, a fierce abolitionist, who devised a plan to take over a United States armory and use the weapons there to initiate a slave rebellion to wreak terror in the hearts of slaveholders. People like Frederick Douglas refused to join him, saying it was a suicide mission. Many of the 22 men who attacked the armory died. Captain John Brown was captured. Henry David Thoreau actively defended the intention to abolish slavery and to resist the reality that the United States government protected and propagated slavery. Captain John Brown would have been gone down in public perception as simply as a madman, but thanks to Thoreau’s essay, Brown became a martyr in many people’s eyes to the cause of abolishing slavery, thus awaking an appetite and willingness to enter Civil War. Two years later, at the age of 44, Henry David Thoreau died of complications of the tuberculosis he long suffered. Thoreau would have been 90 years old when Gandhi read his essay on Civil Disobedience. It was 1907 and one year into Gandhi's satyagraha campaign in South Africa. He expressed his belief that Thoreau’s essay was “the chief cause of the abolition of slavery in America. ... Both his example and writings are at present exactly applicable.” As Gandhi notes, Thoreau went to jail for the sake of his principles and the suffering of humanity. His essay has, therefore, sanctified suffering. In 1944, when Thoreau would have been 129 years old, Martin Luther King was inspired by his writing while attending Morehouse College. As he said in his autobiography, “Here, in this courageous New Englander's refusal to pay his taxes and his choice of jail rather than support a war that would spread slavery's territory into Mexico, I made my first contact with the theory of nonviolent resistance. Fascinated by the idea of refusing to cooperate with an evil system, I was so deeply moved that I reread the work several times. I became convinced that noncooperation with evil is as much a moral obligation as is cooperation with good. No other person has been more eloquent and passionate in getting this idea across than Henry David Thoreau. As a result of his writings and personal witness, we are the heirs of a legacy of creative protest. The teachings of Thoreau came alive in our civil rights movement; indeed, they are more alive than ever before." Today, July 12, marks Henry David Thoreau’s 200th birthday. We have reason to remember him. Not simply because he’s considered the beginning of the modern environmental movement with Walden or a founder of non-violent resistance with Civil Disobedience. I believe we need to reflect on his musings in the context of our age. For Thoreau our lives are worth so much and our values are worth the dedication of our very lives. 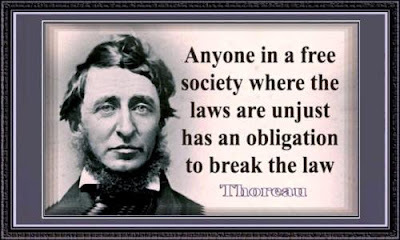 Thoreau paved the way for the Unitarian Universalist principles, especially our seventh principle, to protect the interconnected web of existence of which we are all a part. What would Thoreau be teaching today? My heart is heavy what is happening in Mexico. If you are upset with our president, the president of Mexico has an administration that collects information about journalists and human rights activists who then wind up dead. In Mexico today, there are hundreds of people who follow Thoreau’s maxims and speak the truth about the corruption they have witnessed, and many of these people have lost their lives. If Thoreau lived here in the western suburbs of Chicago, he would call upon his city's governance structure and all those around him to adopt a sanctuary city ordinance. He would urge us to connect with refugees and immigrants as human beings. He would point out how unjust our economic system is for people of color and call for a more equal playing field. He would call us to stand with one another on behalf of those who are exploited whether on the basis of race, class, or any other category. He would support the efforts of Unitarian Universalist Tim DeChristopher who disrupted the sale of federal land near Canyonlands and Arches National Parks by making false bids of up to 1.8 million to block development and bring attention to climate crisis. And he would support the Valve Turners, that group of five senior citizens who turned the valves off of a major oil drilling plant at the cost of likely spending the rest of their lives in prison. He would ask us simply to reflect on his words. Happy 200th birthday Henry David Thoreau. In your lifetime, your impact and influence was limited but has grown as more and more people of integrity and compassion have recognized our need as faithful citizens to integrate practical ethics into self-reliance. May your influence grow as we reflect on your words.